SPES’ summer newsletter is out; click here to read all about what we have been up to over the past few months. 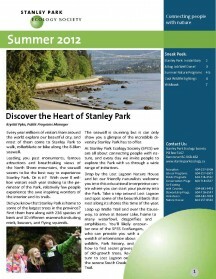 Read about the work we are doing to restore the bog in Stanley Park. A year ago the Beaver Lake Bog was overgrown by a thick layer of salal, but thanks to an army of dedicated volunteers and our partners, we are now well on our way to creating a healthy bog habitat. It is one of only two bogs in Vancouver and contains unique plant species such as sphagnum moss, Labrador tea and the carnivorous round-leaved sundew; a plant which is able to lure and then trap unsuspecting insects. On page 6 you can read about some of the cool wildlife that has been spotted by our staff and volunteers in the park, including the northwestern salamander, a pair of green herons and a sora (or was it a yellow rail?). The middle pages of this newsletter display our fantastic summer events; come along and explore the Park with a naturalist led walk and learn more about the wildlife that lives here.